Just a few days after, the UK’s government announced the construction of a £50 million Holocaust Museum to please country’s Organized Jewry – the outspoken pro-Palestinian and pro-Iran Vicar of Christ Church in Virginia Waters (UK), Bishop Stephen Sizer, posted: “9-11/ Israel did it” on his Facebook page (see above). In order to expose western ‘freedom of speech’ double standard, he added: “Is this anti-Semitic? If so, no doubt I’ll be asked to remove it. It raises so many questions.” Bishop Sizer found the answer when his superiors at the Diocese of Guilford demanded that Sizer must remove the ‘political incorrect statement’ from his Facebook. As a humble servant of Archbishop Justin Welby, the First Jewish Head of the Church of England, he removed the “Offensive Question” from his Facebook page. On January 30, 2015, the UK’s most powerful Israel lobby, the Board of Deputies of British Jews asked the Church of England to take disciplinary action against the Jew hating Christian priest. Jonathan Arkush, vice-president told the Jewish News: “Posting, and giving approval to, an article which in effect accuses Jews of responsibility for the 9/11 atrocity is unquestionably antisemitic, just as it is beyond absurd. The church should be taking action. He is one of their ministers. It should not be left to the Jewish community to have to protest and be forced to take action from outside.” The Organized Jewry never felt ashamed lying about its critics. Iran’s former president Dr. Ahmadinejad was chased by the Israel’s foot-soldiers for planning to Wipe Israel off the Map during his entire 8-year presidency. And then on April 14, 2012 Israel’s deputy prime minister Dan Meridor acknowledged on Al-Jeezra English that Ahmadinejad never made that statement – it’s a lie fabricated by Jewish Memri website. However, with the passage of time, even some Israeli Jewish intellectuals have acknowledged that Israel was indeed behind 9/11 terrorism. For example in August 2012, Canadian-born Israeli Zionist Jewish writer, author and radio talk-show host, Barry Chamish admitted during an interview that Israel played a significant role in 9/11. It’s not the first time, Bishop Sizer has been chased by UK’s Jewish Lobby. In 2012, the Board of Deputies of British Jews, an umbrella body of pro-Israel Jewish organizations including some members of British parliament, lodged a complaint against Bishop Sizer for posting an article by ex-CIA analyst Ray McGovern, entitled ‘Israel’s Window to Bomb Iran‘ on his personal website. He was immediately pronounced ‘antisemite’ by the UK’s Jewish Chronicle for linking the said article to its source, The Ugly Truth. 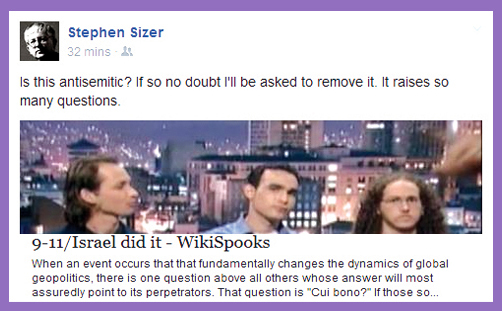 Sizer removed the link when he was told that the source was a racist website. The Ugly Truth is run by Mark Glenn, an American Catholic journalist, author and radio talk-show host. Mark is anti-Zionist regime but not hateful towards moral Jews. He is also the co-founder of the interfaith writers group, ‘Crescent and Cross’. Bishop Sizer has attended several interfaith, educational and political conferences held in Iran. In October 2014, Bishop Sizer along with Medea Benjamin, an American Jewish activist, American investigative journalist Wayne Madsen, Canadian Jewish writer and author Eric Walberg, American investigative journalist and author Gareth Porter (Jewish), Brazilian investigative journalist Pepe Escobar and Mark D. Siljander, PhD, an Evangelical Christian, former Republican congressman, attended Tehran’s New Horizon Conference. See Bishop Sizer photo at the conference below taken by Canadian professor Anthony James Hall (University of Lethbridge). A most interesting post. However, perhaps not so very recent news. Please refer to former German Congressman Andreas von Bülow’s 2004 (!) book “CIA and September 11”, and, of course, the very thorough work on this matter by Christopher Bollyn, “Solving 9_11”.